December 24, 2017 /Photography News/ During wartime there is always an attempt to maintain some of the traditions from home. 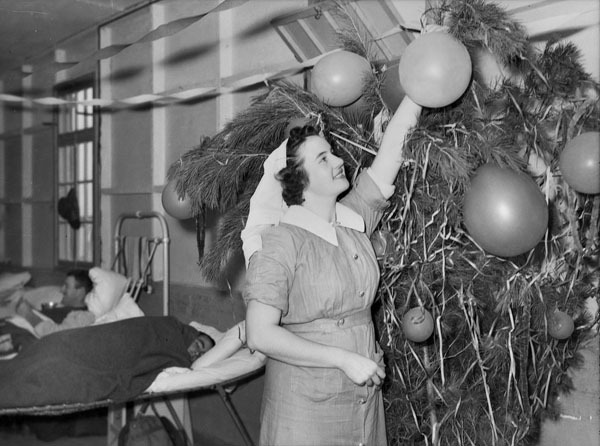 These photos show some of the ways Christmas has been celebrated during wartime all over the world. Christmas in Melbourne, Australia, 1942. 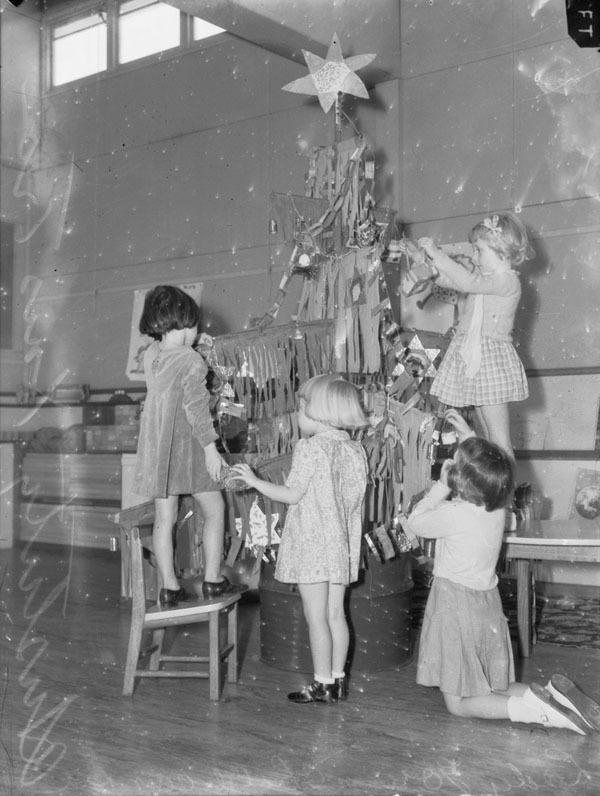 Four little girls decorate their austerity Christmas tree at a suburban school. The tree branches are constructed of sticks hung with fringed paper and foil stars are used as decorations. Buna, Papua, 1942. 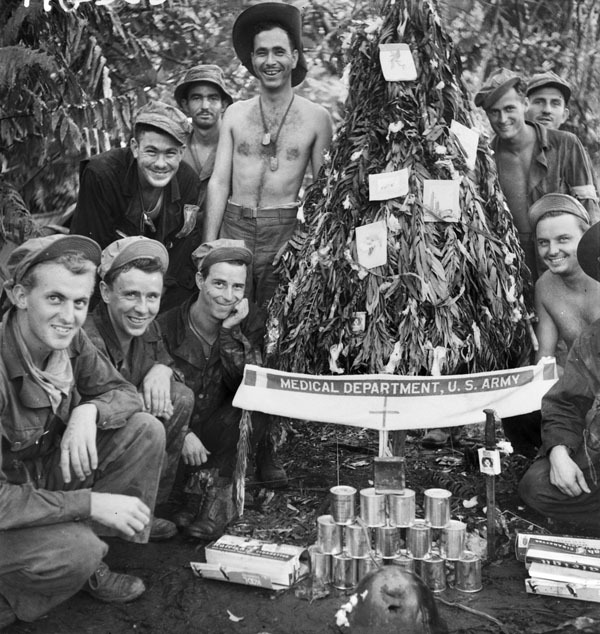 American soldiers at an advanced dressing station with a handmade Christmas tree decorated with surgical cotton wool and cigarette cartons. Christmas in Bari, Italy, 1943. Pilots of No. 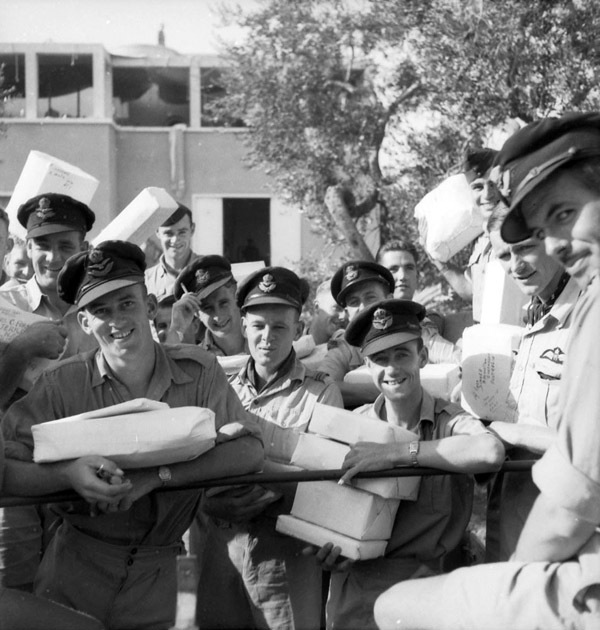 3 (Kittyhawk) Squadron RAAF, on their way to the Army Post Office with parcels ready to catch the Christmas mail. Ramu Valley, New Guinea, 1943. 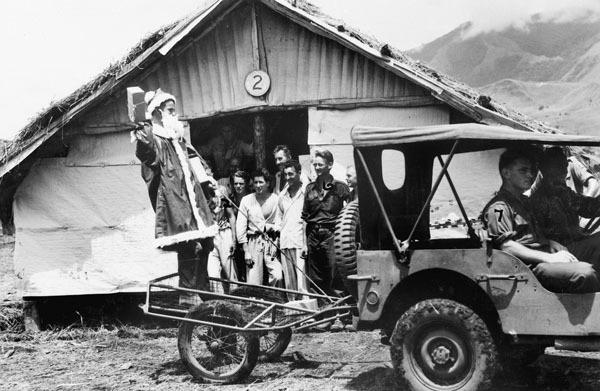 NX103434 Captain F. D. Smith, dressed as Father Christmas, arriving at one of the wards of the main dressing station, 2/6th Australian Field Ambulance, in a jungle cart (Thompson Stretcher), drawn by a jeep, to distribute Christmas presents to the patients. Identified personnel are: SX28258 Private E. J. Cummings; TX5952 Private R. G. Viney, and Corporal R. Roessler. Christmas on HMAS Benalla, 1944. Pacific Area No. 23. Father Christmas on HMAS Benalla was Telegraphist John Barry of Port Melbourne, Vic, 24 years old with six years Navy service. He was employed in a fruit canning plant before going to sea. A pine Christmas tree is filled with wrapped presents. 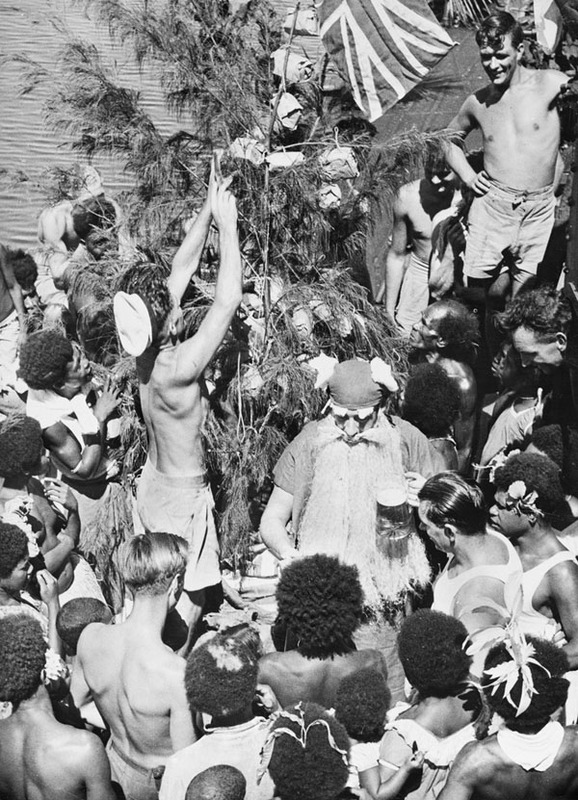 Father Christmas, holding a jug of beer, is surrounded by interested natives and sailors. 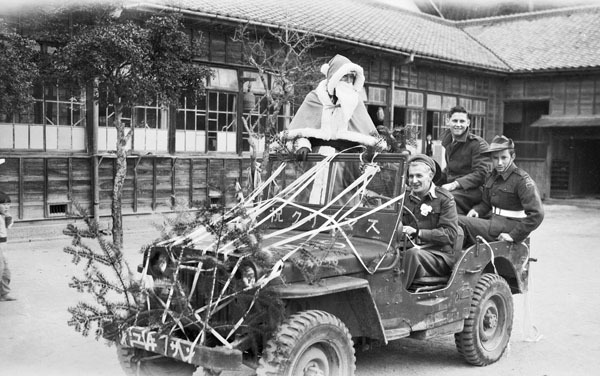 Christmas in Korea, 1953. 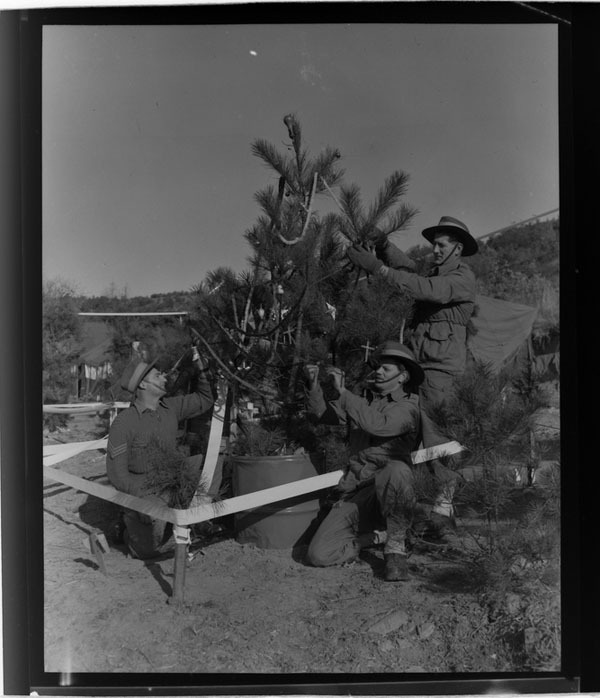 The finishing touches are made to the Christmas tree at C Company, 3rd Battalion, The Royal Australian Regiment (3RAR), by Sergeant Alec Livermore of Chester Hill, NSW, the Company Sergeant Major (CSM); Private (Pte) Kev Keehan and Pte Peter Ferrier of Ringwood, Vic. This tree has electric lights powered by the Company generator which flash on and off at night. Vietnam. 1965-12-25. 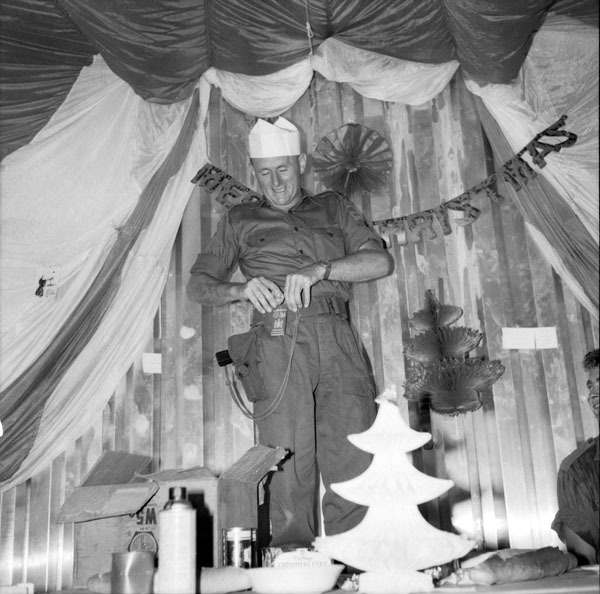 Despite Christmas festivities the war is never far away as indicated by the pistol worn by Warrant Officer Harold Smith, Company Sergeant Major, B Company, 1st Battalion, Royal Australian Regiment (1RAR), of Macquarie Fields, NSW. Warrant Officer Smith was just presented with a medal for endurance above and beyond the call of duty during the hectic Christmas Day celebrations. Nui Dat, Vietnam. 1967-12. Newly arrived members of 3rd Battalion, The Royal Australian Regiment (3RAR), preparing their base camp for the Christmas season. 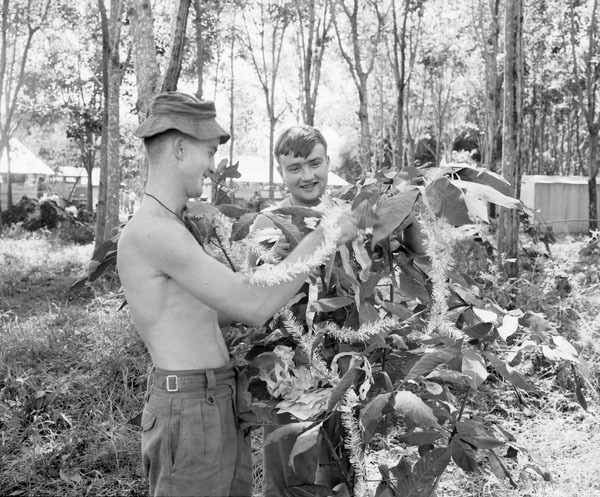 Private John Barnes of Mullewa, WA (left), and Lance Corporal John Phillips of Coleraine, Vic, putting final decorations to a rubber tree outside their tent. Nui Dat, South Vietnam. November 1970. Corporal Arthur Wallis, 21, of Preston, Vic, sharpening a knife in preparation for carving the three prime hams he has prepared for Christmas. 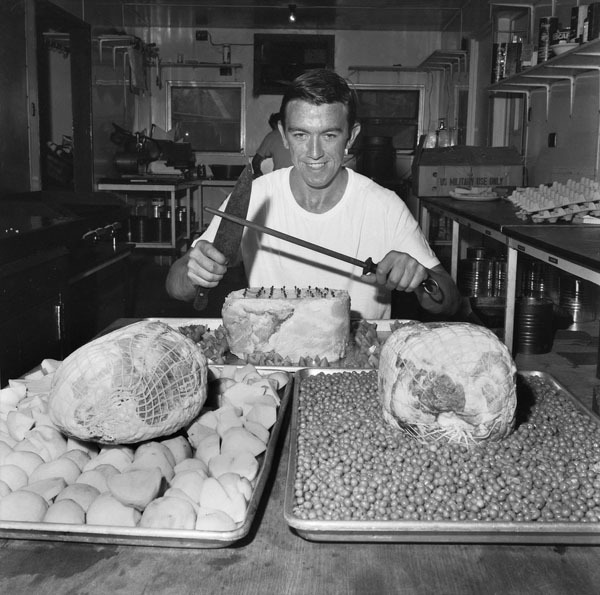 He is one of 200 Army cooks who have been sharpening their wits, and their knives, to give Australian troops in Vietnam a slap-up Christmas lunch and dinner. South Vietnam, 1971. 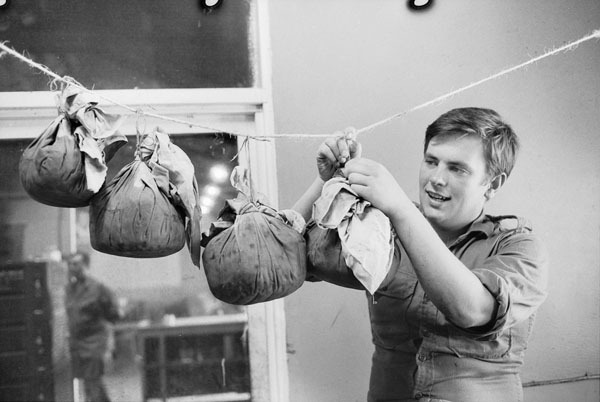 Private (Pte) David McColl of Page, ACT, hanging puddings to mature before Christmas. Pte McColl spent his spare time during the weeks leading up to Christmas supplementing the supply of Christmas cakes and puddings provided by families and friends of soldiers still serving in Vietnam. Fascinating pix. Good work, cobbers, now and forever! !